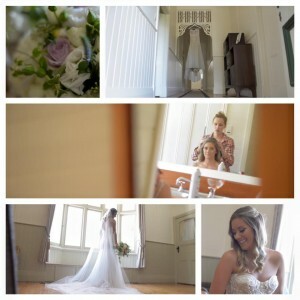 Carly + Dave were married at the gorgeous Immerse Winery in the Yarra Valley in February 2016. Hitched Productions have had the pleasure of shooting several weddings at Immerse over the past few years and this wedding was just beautiful from start to finish. Immerse over 20 rooms of accommodation onsite and Dave and the boys decided to use the bridal suite for their preps. Carly and her bridesmaids had organised accommodation in Healesville. We worked alongside Mike Semple Photography and it is always fun working with Mike. Meg Marshall officiated the ceremony in the chapel at Immerse. 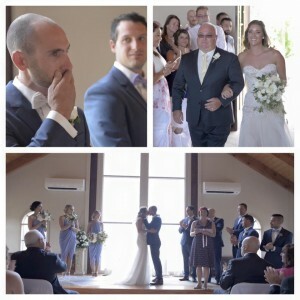 Dave shed a tear (or ten) as his stunning bride Carly was escorted down the aisle by Viv her father. Guests were spoilt with ice-cream and games on the lawn following the ceremony whilst we took the bridal party up into the vineyard for photos. The speeches were absolutely fantastic from the heartfelt words of Viv, to the bridesmaids musical number as well as Dave’s lovely speech where he mentioned ‘spanking people’ (watch the video below…). We were incredibly humbled to be part of Carly + Dave’s day and Tanya and I were thrilled with the film we created for Carly + Dave. We posted this film on Facebook and took great pleasure in looking at all of the beautiful comments Carly + Dave’s friends and family made. Most people mentioned that they had cried watching this film which is exactly the reaction we are after. So, sit back and enjoy Carly + Dave’s wedding film and a series of screen captures from their beautiful wedding.